We’d love your help. Let us know what’s wrong with this preview of Alex's Challenge by Melissa J. Morgan. To ask other readers questions about Alex's Challenge, please sign up. What is the secret she is hiding? Sherby That she likes Adam and Adam likes her back. Friendship is just like a special, breakable diamond that should be handled with care; if you don’t get handle it with care it would break, and we would be hard to put the pieces back together. For three years Alex has gone to the summer camp; this year was going to be her fourth. Alex is main character, she’s always known as Miss perfect. But this year, everything changed. Alex, for her new elective has gone to wood making, in there she met Valerie. For the past three years Ale Spoiler Alert!!!! Friendship is just like a special, breakable diamond that should be handled with care; if you don’t get handle it with care it would break, and we would be hard to put the pieces back together. For three years Alex has gone to the summer camp; this year was going to be her fourth. Alex is main character, she’s always known as Miss perfect. But this year, everything changed. Alex, for her new elective has gone to wood making, in there she met Valerie. For the past three years Alex had been best friends with Brynn. When Brynn saw Alex with Valerie, Brynn thought that Alex has forgotten about her and got a new friend. So, Brynn become friends with Sarah, who was Valerie’s best friend. Both groups stayed the same for a long while; trying to make each other jealous about their new best friends. But, in each person’s heart there was something that told them they were missing their old friend, that they loved them and would like to be back together. But, they only realized it when something happened…. Something that changed people’s idea about Alex being Miss perfect. Something that made the camp flip upside down. I would recommend this book for people between the age of 11 to 13 years old; that like to read friendship books. ~Memorable character: Valerie, when Brynn(Alx's best friend) starts to be mean to her and be friends with Sarah. Valerie trys to help her in many ways. ~I felt that i wanted to read more of the book written by her. - Alex's camp friends thinks that she is perfect, but this summmer, Alex seems different. She has upset her bunkmates and is always making excuses and mysteriously sneaking off(she has diabetes!). Alex loves Camp Lakeview lots! She gets to be with her friends and play all kinds of sports. She has gotten diabetes and has not told her friends. Brynn begins to not friend Alex and Alex feels very sad. Soon, Alex fainted during COlour war and all of the friends knew about Alex having diabetes. When Brynn and all of the friends understood Alex has diabetes and treated her very nice. After really enjoying the first three stories in the Camp Confidential series (reminding me of my own childhood experiences at camp decades ago), I was disappointed by book 4. It could use some serious editing (the number of "just's" could have well been a voice choice but it really bumped me out of the flow of the story to see three or more sometimes in a single paragraph) and the overly dramatized "fight" between the girls seemed pretty petty and unnecessary. It also felt like the author was d After really enjoying the first three stories in the Camp Confidential series (reminding me of my own childhood experiences at camp decades ago), I was disappointed by book 4. It could use some serious editing (the number of "just's" could have well been a voice choice but it really bumped me out of the flow of the story to see three or more sometimes in a single paragraph) and the overly dramatized "fight" between the girls seemed pretty petty and unnecessary. This was my second favorite book out of the Camp Confidential books that I have read so far. 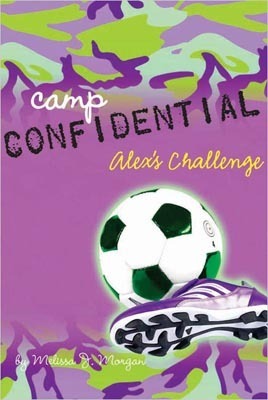 Camp Confidential Alex’s Challenge by Melissa J. Morgan is a fiction book. The theme of this book is that sometimes not everything works out the way you want it to. Many people are good at different things so we learn from each other. This book is about teenage girls going to a camp for the summer. In this book there is some drama between friends and not everyone agrees all the time. Like in school, at this camp you take some classes to learn new things. All the girls and guys ge Spoiler Alert! This book is about teenage girls going to a camp for the summer. In this book there is some drama between friends and not everyone agrees all the time. Like in school, at this camp you take some classes to learn new things. All the girls and guys get along and learn the different skills that everyone has. When everyone at the end goes home they realize how much fun they had and everyone is ready for the next summer. Since I am a teenage girl I think this book is really entertaining. The author is really good at explaining the issues that you can have when you are with friends but also that everyone can get along. So I agree with her a lot in the book. This book suggests that everyone should give each other a chance to get to know them. Sometimes in the world people just go by what they have heard but in this book it is about bringing people together. If you are at a camp trying to learn about different people and how they are like you, you will have to pay attention to what they are saying. Sometimes things don’t always go the way you want and you might not end up as close as you thought you were but everyone is similar in different ways. This book would relate to many books. If you have a book that involves teenagers, drama, fun, and differences then they will be alike. The rest of the books in this series all kind of revolve around each other and they are unique in their own ways. This author is also pretty different from a lot of other authors so her books are more unique. This book affected me in very many ways. Just like in this book I have a friend that plays soccer and she has diabetes. She isn’t very open about having diabetes but people do know enough about it that we don’t judge her by how she is. Also, I have gone to some camps in my life and have met many new friends and of course there was some drama. I really enjoyed reading this book and it is great for teenage girls. They will learn that just like them, lots of other girls have the same things going on in their lives also. When tearing friends apart for a couple of days and then bringing them back together everyone usually ends up closer than before. If you read this book you should stop and think a couple times how it relates to you. 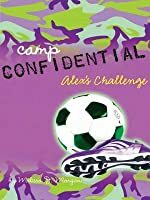 The book I read was “Camp Confidential: Alex’s Challenge.” The author of the book is Melissa J. Morgan and it was published in 2005. Alex is a soccer player and she loves sports and winning. Alex’s best friend Brynn loves drama class and always asks Alex to help her practice her lines with her. Alex and her friends love to go to Camp Lakeview every year. This book is informative and practical because it shows us the reality in friendship. This book is about Alex’s and Brynn’s friendship falling The book I read was “Camp Confidential: Alex’s Challenge.” The author of the book is Melissa J. Morgan and it was published in 2005. Alex is a soccer player and she loves sports and winning. Alex’s best friend Brynn loves drama class and always asks Alex to help her practice her lines with her. Alex and her friends love to go to Camp Lakeview every year. This book is informative and practical because it shows us the reality in friendship. This book is about Alex’s and Brynn’s friendship falling apart. When Brynn got closer with Sarah, Alex was mostly with Valerie because they had woodworking together. Alex was confused at first with Brynn because she kept ignoring her. Alex thought that maybe during the game called colorwar they would get back together. All of this happened because Alex went swimming with Valerie instead of Brynn. After this incident Brynn got mad at Alex and made a new friend. Alex Kim is finding the lat two weeks of camp particularly difficultly. on top of now having and ex-bestfriend, the other girls in her bunk are getting suspicious about her eating habits. some of the girls in the bunk think that she might have an eating disorder, but none of them know the real truth: that Alex was diagnosed with type 1 diabetes just last fall. I would recommend this book to anyone because the writing perfectly captures how she was dealing with her ex-bestfriend and keeping her di Alex Kim is finding the lat two weeks of camp particularly difficultly. on top of now having and ex-bestfriend, the other girls in her bunk are getting suspicious about her eating habits. some of the girls in the bunk think that she might have an eating disorder, but none of them know the real truth: that Alex was diagnosed with type 1 diabetes just last fall. This book was really good and I am enjoying the series. This book was about Alex Kim going to Camp Lakeview for the summer to meet new people or to have fun. Everyone thinks of Alex as a girl who is outing, sporty, and responsible. Now, she is changing her attitude a lot like, being less active and getting out of eating some foods. She is stuck in a situation because she has new and old friends surrounding her but they are starting to resent it. Alex is afraid to tell her friends a secret but if she does, she thinks nothing can be the same. Alex is facing a challenge. This out of the firt four was the worst. But it was still okay. She is verry athletic but through out the whole story it talkes about the same thing!!!! SPORTS! Sometimes I felt like okay, okay i get it! Shes ubsessed with soccer we all know. I ve just got to say that -hands down!-this is one of the best books ive ever read.it is actually realistic and it relates to real relationships and problems yet its written in a way that made me want to read it!I look forward to reading the rest if the series! I don't know what I was thinking when I bought it, because I didn't read it until at least two years after, but when I did I thought it was a really good book, and now, the best one in the series. Haven't read them all yet though. Alex is definitely one of my favourite girl in the series. Super sad she doesn't have another book of her own in this series. Alex has many challenges. She goes to a new camp so she has to fit in. Good series for middle school readers. Lots of action and different personalities. Nothing too controversial. 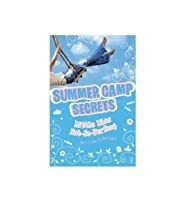 This is the same as all the other Camp Confidential books: short, easy, fun, simple, light, tweens not teens. i wonder what is alex's problem about not getting to eat junk food? This one was good though I am not completely loving these. Good for a short readand for girls 12 and under. I will be reading the necxt ones however. not the best in the series but still a good read!